Do you want to start a profitable business with little capital in Bangladesh? A wedding stage decoration business in Bangladesh is one of them. 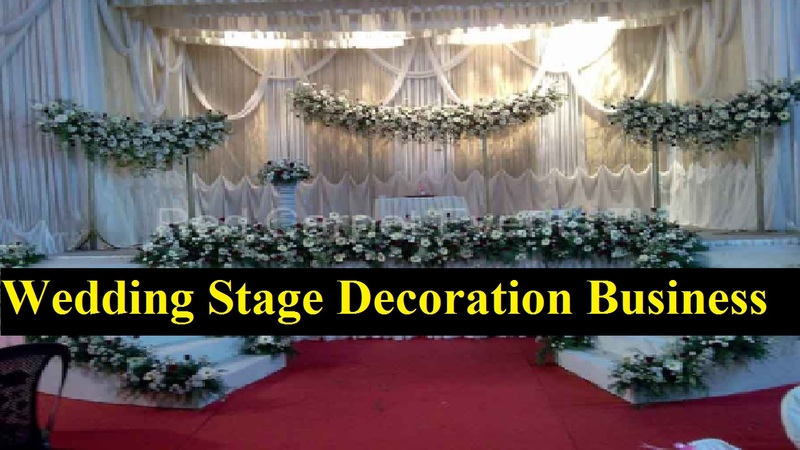 There are numerous elements such as traditional flowers, oriental flowers, standees and props, curtains, drapes, crystals, decorative stones etc when you start a wedding stage decoration business in Bangladesh. Their tastes and opinions are incorporated into the design because each wedding stage is customized for different couples. Also, the wedding stage decoration gets customized based on budget and color preferences. Moreover, the designing team creates 3-D models of the entire wedding venue with due care given to lighting, movement, and flow. There is the rough output of how a wedding stage would look on the wedding day with 3D modeled wedding stage. Besides, flowers are essential for the beautiful wedding stage. But, if you have your guests walk into the reception and having their jaws drop at the breathtaking display of wedding flowers, nothing is more incredible. As it’s not a flourished business, you have a great opportunity in a wedding stage decoration business in Bangladesh. The country’s growing economy has made the opportunity. That’s why you’ll find two options on this business venture. Among them, the first one is to be partnering with an event management team and the next is obviously specializing for stage decoration alone. You know that all events will not depend on an event manager because the customer can himself make his own plans and coordination. So, you can directly enter into the scene as a decoration partner in these cases. As there is no product to showcase to the customers, your business is purely related to the quality of the service. As a result, the review on those will be the only tools to judge your service. If they plan their big days then brides-to-be and their grooms-to-be seek assistance from a variety of professionals in the wedding industry. As the economy of Bangladesh is developing gradually, the bridal industry is booming as well. Because the aspiring entrepreneurs are attracted to the industry, it’s no wonder creative. Although it requires a great deal of planning, home-based wedding stage decoration business requires little to no startup costs. It’s the most attractive architecture implementation of any event in a center of a venue. Although everyone can design a wedding stage, all are not have been memorable. This is because it’s an act of creativity. Also, there is a price always untouchable without any reason in many more design shops. Well, let’s know the steps to start the business. A marketing plan for any business is something like the life. It should be included networking with other industry professionals, blogging about wedding topics on your business site, attending wedding trade shows and offering seminars to brides-to-be. As generate leads for business is essential, these marketing activities will help you. Besides, it must be a reflection of your entire business, from top to toe. As this decides the profitability of the business, depth research is needed in this area. So, make a clear-cut list of what all you need along with deciding the size of your business. Also, it’ll create an impact on the investment you have planned for the rent or buy the concept. Moreover, you don’t have to purchase event decor items in advance in this business. What you need is to contact material supplier when the order comes. That’s why you can start a wedding stage decoration business with very minimal investment. That will be the sum of your investment, which is the value of the items you have in your company. Keep all the necessary items ready to make successful event decoration without any hindrance at work. You should purchase small things which are of less value whereas the ones which hold a high value can be rented. If you hire the heavy things then you can save your investment. As some of your things block your cash here and there, you should not spend too much on those things. Also, simply consider the frequency of using a particular item also helps in rent or buy decision making. And this way you can save money and space where you store them. However, there are some standard items for all event decoration businesses and some basic. You should keep the basic items always ready such as ladders, pins, screens, decor lights and tools. But, few products might change according to the orders and customer’s expectation. Publish your existence as much as possible for making fast progress in the results. The social media is the latest trend that’s keeping us updated. Also, seeking various services, a lot of people depend on social media. So, if you want to obtain the central place in the decoration industry then use this opportunity. It’ll help the customers to choose the most suitable and economical one including prices along with the examples. As it focuses on the target crowd, we would recommend you to adopt advertising methods. But, people who do not use it, it’s of no use of advertising about a decoration company. Moreover, there are some other ways that essential to promote your business. These include business cards, banner, flyers, and many more. It should be included in all your work as wedding stage decoration business is all about your creativity. Although it should not restrict the ideas you have in your mind, checking the competitor’s style or the latest trend is important.